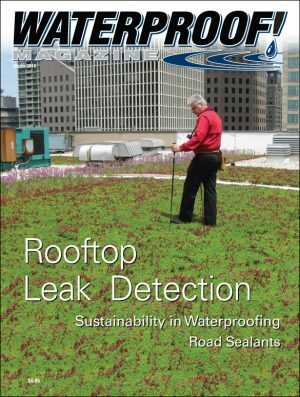 Integral waterproofing can be faster, cheaper, and more reliable than coatings and membranes. 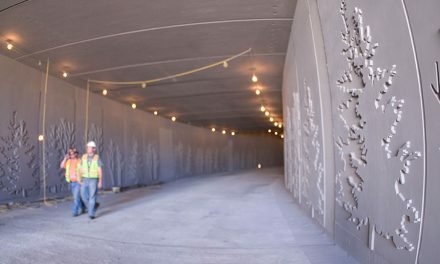 The California Academy of Science in San Francisco used large quantities of crystalline waterproofing to seal the slabs and foundation walls. Mixed at 2.5% of the Portland cement content, the job used over 48,000 pounds of admixture to waterproof the 4,000 yards of concrete in the structure. Concrete is one of the most widely used building materials, used on everything from residential basements and foundations to tunnels and water treatment plants. Although hard and dense, it is a porous material which makes it highly susceptible to damage and deterioration from water and chemical penetration. That’s why nearly all commercial and residential concrete projects specify some type of waterproofing system. Traditionally, contractors apply either a spray-applied coating or a peel-and-stick sheet membrane to keep moisture out after a concrete structure is constructed. However coatings and membranes can be torn or damaged during backfill, could delaminate, decompose or deteriorate over time. 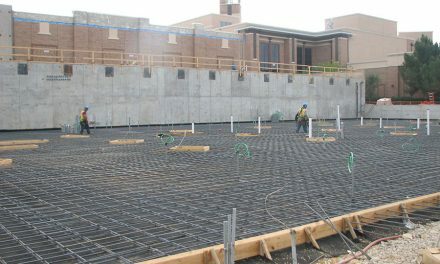 Instead of relying on membranes installed after the pour, an increasing number of owners and contractors are turning to integral waterproofing to make the concrete impervious to moisture. Integral waterproofing uses chemical admixtures, usually a dry powder or liquid added to the concrete mix at the batch plant or the jobsite. 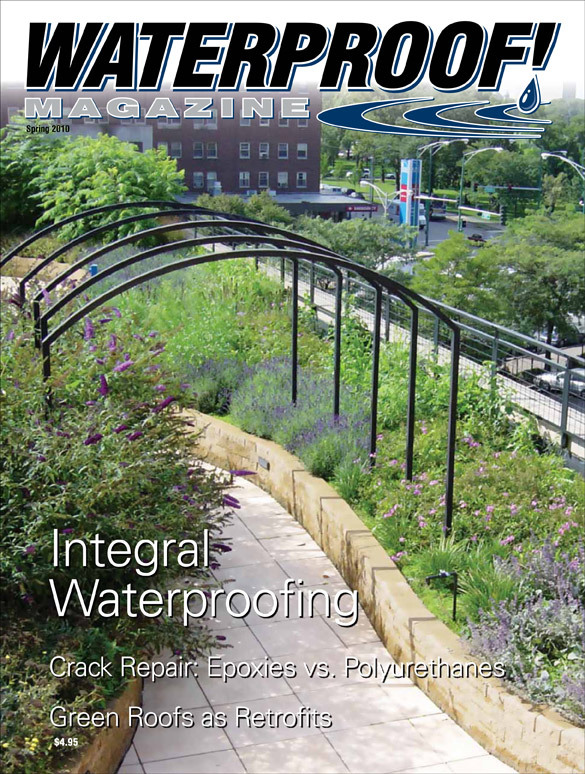 Some forms of integral waterproofing will even self-heal minor cracking. 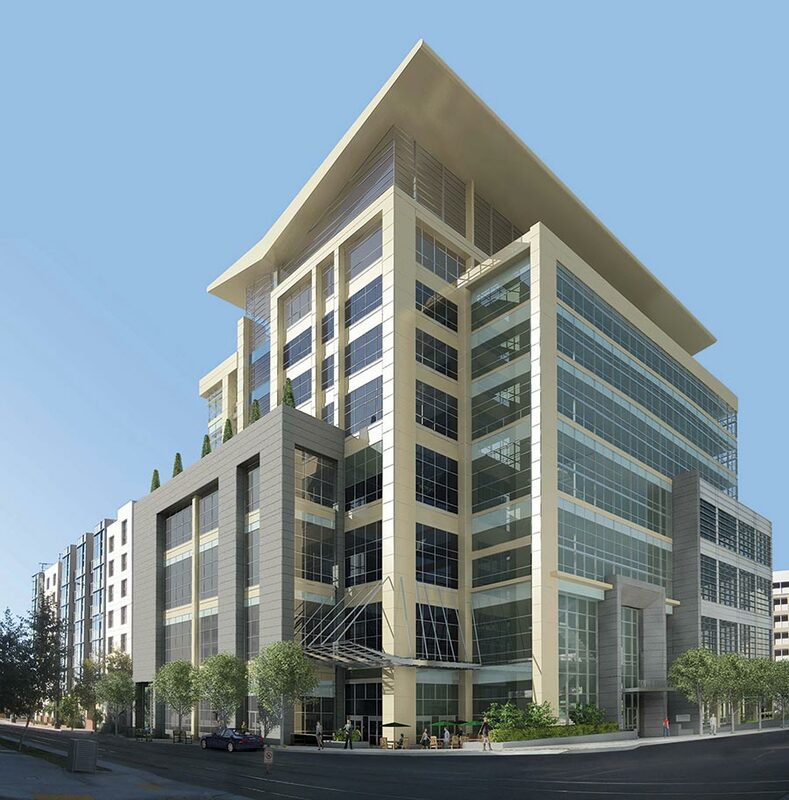 The Thomas Jefferson School of Law, located in downtown San Diego, California, is pursuing LEED-Gold certification. The three levels of underground parking and eight floors above grade all needed to be waterproofed. By using Hycrete’s membrane-free integral admixture, the school reduced the construction critical path by four weeks and saved an estimated $187,000. It also eliminate 36 tons of landfill debris, an estimated 18,567 pounds of polymers, and improved the concrete’s recyclability, as future membrane removal is eliminated. Integral waterproofing offers a number of advantages over coatings and membranes. For instance, integral waterproofing can’t be torn or damaged during backfill, and will not delaminate, decompose or wear out. Integral waterproofing is extremely useful for blindside work—such as deep foundations and bored tunnels—where the waterproofing solution can be incorporated into the concrete batching process. It’s also useful for complex designs where sheet goods would be difficult to apply. For all these advantages, integral waterproofing is surprisingly cost effective. In fact, it saves so much time and money in the construction process that it’s not uncommon to shave months off the construction schedule. For instance, integral waterproofing was used in the below-grade portions of Singapore’s “Theatre on the Bay,” a performing arts center that would be subjected to significant hydrostatic pressure and a harsh marine environment. Xypex Crystalline Waterproofing replaced the originally specified membrane because of its ability to withstand the hydrostatic pressure and to protect the reinforcing steel against corrosion. But it also accelerated the construction schedule and saved the contractor more than two months. Aaron Ayer, vice president of marketing and business development at Hycrete, says his company’s products are typically 30% less expensive that comparable membrane solutions and can eliminate a few weeks from the critical path construction schedule. There are other advantages as well. For instance, integral waterproofing products can be applied in almost any weather. There are few temperature restrictions; if temperatures are adequate for pouring concrete, integral waterproofing can be installed. Most importantly, it saves the time and expense of a separate waterproofing process. Additionally, excavation contractors can dig a smaller hole, since workers won’t need to access the outside of the building foundation. On large buildings, the excavation savings alone are often enough to justify integral waterproofing. Lastly, nearly all integral waterproofing products can be considered “green.” There’s no off-gassing, no VOC’s, no chemicals leaching into the soil. It can easily be recycled along with the rest of concrete. 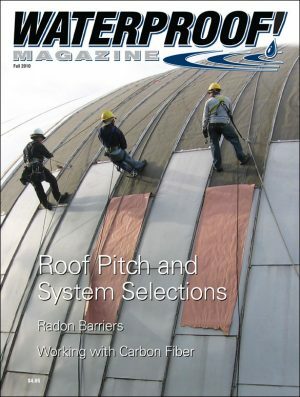 Integral waterproofing products are marketed under a dozen or more different brand names. While the chemical composition of each is slightly different, they all are either densifiers, repellants or crystalline admixtures. 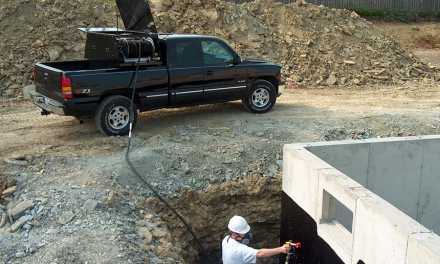 Densifiers fill the microscopic pores in the concrete matrix to eliminate water infiltration. Water repellants make the concrete hydrophobic. Crystalline admixtures cause microscopic, water-blocking crystals to seal pores and hairline fractures. This series of photographs, taken through an electron microscope, demonstrates how crystalline waterproofing can physically block the moisture coming through the pores and hairline cracks in the concrete. At left, the void is clearly visible. Center, the crystals are clearly visible. At right, the void has been completely sealed. Here’s a detailed look of how each of these techniques work, as well as the distinct advantages each method offers. Densifiers: Densifiers use pozzolans—usually silica fume or other silicates—to fill the pores in the concrete matrix. Silica fume is an industrial byproduct created in the refining of silicon metal and its alloys. In its original form, silicone dioxide is extremely fine— about 1/100th the size of the average Portland cement particle—and has the same consistency as cigarette smoke. These particles are captured, condensed, and sold as a concrete additive. Silica fume, because of the extremely fine particle size and the high silicon dioxide content, reacts readily with water and fills the microscopic pores in the concrete. It also adds considerable strength to the mix. Using silica fume, concrete with compressive strength in excess of 15,000 psi can be readily produced. Densifier-type integral water-proofers are a top choice when high-strength concrete is needed. They’re also a good choice when concrete will be exposed to de-icing salt such as in roadways and bridges. Repellants: A newer class of integral waterproofing products work by developing polymer barriers inside pores during the hydration process. The water repellent nature of the polymers can cause water to bead on the surface of the concrete. The surface tension of the water itself keeps it from being able to penetrate the wall. The active ingredient of these admixtures can include stearates, petroleum-derived materials, or water based materials. Waterproofing additives of this kind include Everdure Caltite and Hycrete. This type of integral waterproofing is popular for above-grade work, such as precast cladding panels. A few brands of this type, though, can be used in foundation walls. In fact, he says, the amount of Hycrete material arriving on a jobsite is usually less than the amount of waste materials leaving a jobsite on a membrane installation. Crystalline: The third major class of integral waterproofing is crystalline technology. In the presence of water, the ingredients of these products react with calcium hydroxide and other by-products of cement hydration to form non-soluble crystals that fill and plug the pores and microcracks in concrete—even years after it was poured. Crystalline products can be applied in several different ways (see sidebar page 17), but adding it to the mix at the batch plant is the most common. Xypex’s Faure states, “Adding crystalline waterproofing treatment to the concrete mix at the batch plant ensures that the crystalline formation occurs uniformly throughout the structure, rather than penetrating from the surface, as would be the case with a surface application. The admixture reduces the rate of water loss in fresh concrete, resulting in less shrinkage and increased compressive strength. He adds that, unlike many coatings and membranes, crystalline products are so safe they have been approved for use inside tanks that hold drinking water. In this blue-dyed concrete sample, the naturally occurring shrinkage cracks (left) have been sealed by the admixture’s nanocrystals. Crystalline admixtures are also self-healing, reacting throughout the life of the concrete structure to automatically seal cracks up to half a millimeter wide. This is especially useful on large concrete pours, as it is enough to waterproof most cold joints with no additional treatment needed. Crystalline waterproofing is also extremely durable, and in laboratory tests have withstood up to 200 psi. That’s 460 feet of hydrostatic pressure. “Crystalline waterproofing is preferable to use in any project where the concrete will be subjected to hydrostatic pressure,” confirms Yuers at Kryton. 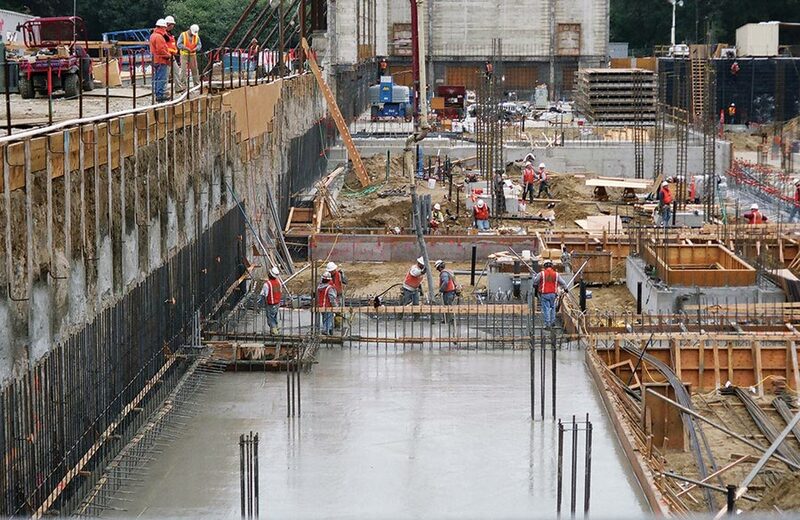 McGraw-Hill, the largest provider of project news, plans, and specifications for North American construction projects, indicates Xypex is the most common brand of crystalline waterproofing product in the United States and Canada, but there are several others. Kryton’s Krystol Internal Membrane (KIM) has been used around the world for more than thirty years. Similarly, Kryton offers Krystol Waterstop Joint system (KWS), which won a Most Innovative Product Award at the 2006 World of Concrete. Integral concrete does have a few disadvantages. It will not, for example, span cracks larger than half a millimeter. Joints, penetrations, and transitions will need attention as well. In some instances, such as basements of single family homes, a contractor may still need to provide an adequate drainage system to avoid water buildup through the life of the structure. 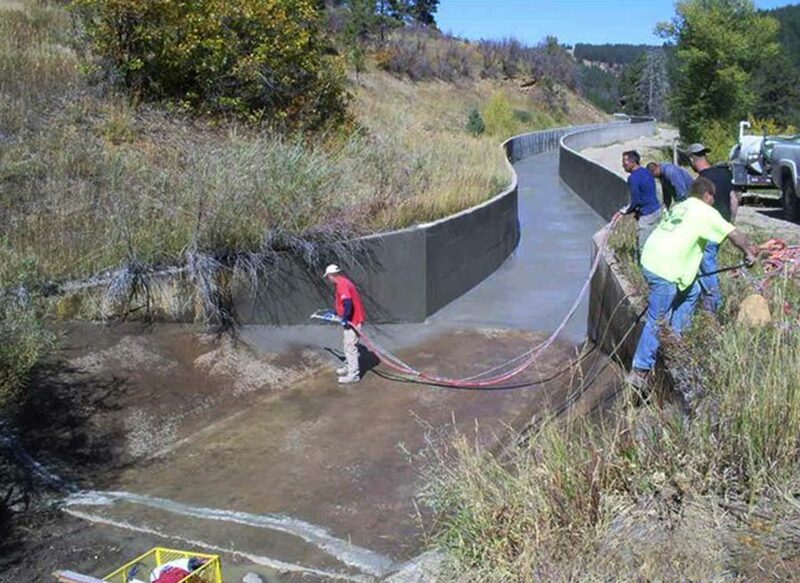 When the 60-year old, 2.6-mile-long concrete Inlet Canal in Southwestern Colo. began to show signs of serious deterioration, integral waterproofing was a perfect solution. A critical component of the Jackson Gulch Reservoir, the canal suffered from surface spalling, joint deterioration, wall blowouts and vertical wall cracks. 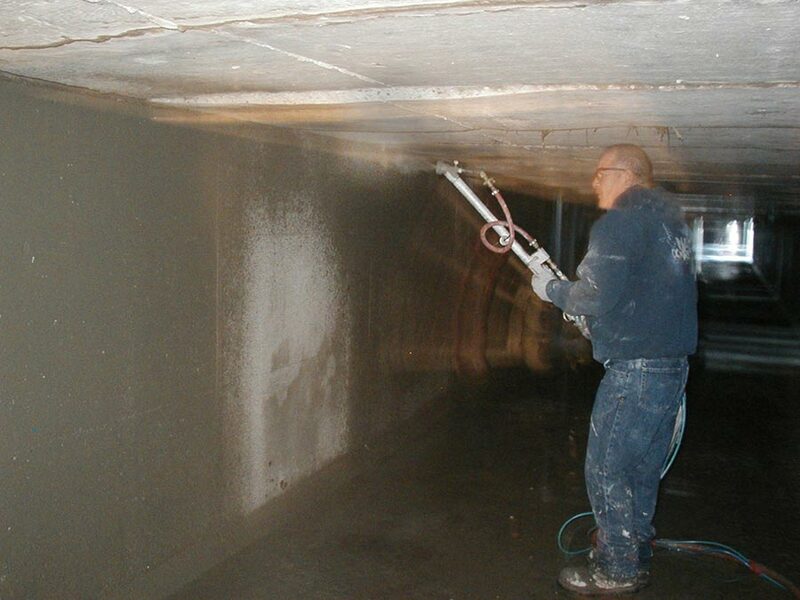 Buckhorn Geotech selected the Xypex Admix spray-on crystalline waterproofing system that the firm had successfully used on smaller concrete projects with similar deterioration problems. Blended into fresh concrete or spray-coated on existing concrete, Xypex Admix sealed the primary paths by which water and aggressive chemicals penetrate, attack, and ultimately threaten the long-term integrity of the concrete structure. The contractor selected the crystalline waterproofing system because it could be installed in confined spaces as well as the system’s ability to seal or heal itself should damage occur to the concrete surface from falling rock or routine maintenance in the coming years. Faure notes that integral waterproofing is extraordinarily flexible in terms of application. In addition to being added directly to the concrete mix at the batch plant, crystalline waterproofing can be used to waterproof slabs after they’re already poured. For freshly placed concrete, it’s possible to dust the surface with the powder and trowel it into the surface during finishing. Xypex DS-1 and Kryton’s Krystol Broadcast, for example, are intended for this application. 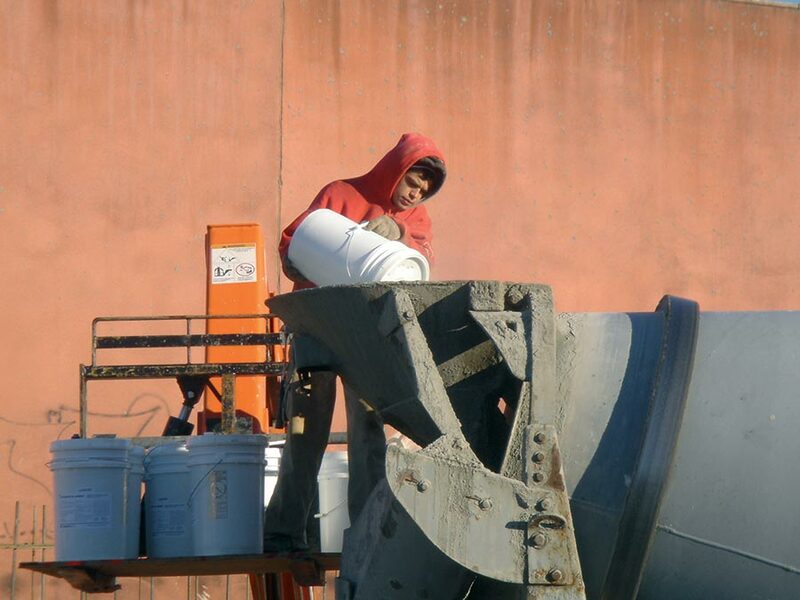 For fully cured concrete, crystalline products can be applied directly to the surface of an existing concrete structure after soaking it thoroughly, or as a slurry coat. According to Elena Danke, director of marketing at Aquafin, the slurry coat can be applied with either a brush or with suitable spray equipment. With the same active ingredients as the liquid admixture, Aquafin-IC it penetrates into the concrete surface and becomes an integral part of the structure. 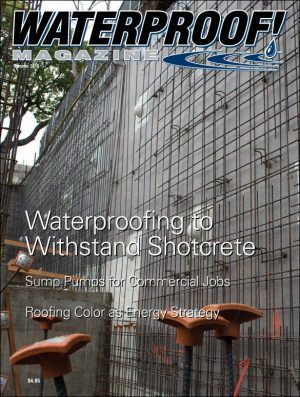 “It’s perfect when waterproofing interior foundation walls, elevator pits, and so on; when waterproofing from the outside is not an option,” she says. “Even if the coating is slightly damaged on the surface, the waterproofing properties are not lost, as the ‘waterproofing’ itself takes place within the concrete.” Like waterproofing added to the mix design, crystalline slurry coats will also self seal shrinkage cracks, up to 1/64” (0.4 mm) when water is present. Kryton offers Krystol T1 and T2, a two-step process that produces similar results. A third option is Izonil, which is available as a concrete additive or as a unique waterproofing plaster. Made from Portland cement, sand, fibers and the proprietary Izonil waterproofing additive, it is completely waterproof when dry, yet remains permeable to air and water vapor. The fine grade plaster can be used as an undercoat, or applied by skilled applicators, as a final finish coat. According to Arpad Nagy at Izonil, the product is perfect for restoration, repair work and new plastering where protection is needed against water damage. 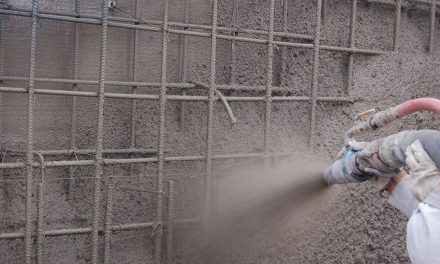 The Izonil additive is being used by concrete and cementitious product manufacturers to provide integral waterproofing for their own unique products. For example, CarpenterStone incorporates the Izonil additive to their Stucco and Drainage Plane products thus eliminating the need for waterproof membranes and sealers.